Yes, the finest S-VHS VTRs have now been added to The Transfer Lab. 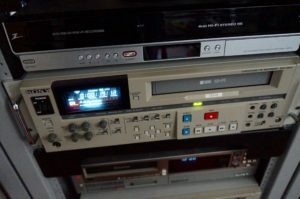 This Sony S-VHS VTR does a fantastic job playing back VHS material. Far superior to home units, it contains a built-in TBC that has noise reduction and image enhancement, something home units do not offer. Since this machine is interfaced to our system, it must be able to genlock. Another feature lacking in home units.